1800, France….or is it 2078, New Paris? Strapped inside a corset, sweating under layers of cotton, I opened the door and stepped out. A robot hovered past, feeding hot air up my petticoat. For Trifextra. The theme this weekend was ‘Time Travel’. Could I have done anything else but the Doctor?! This entry was posted in Uncategorized and tagged Fan Fiction, Humour, Sci-Fi, Trifecta, Writing Challenge. Now THAT is time travel! Nicely done, Sandra :)) You were able to get so much into those 33 words and I like that perfect line at the end. Ha! I love what you did with this. Whoa! There and back and forward! So clever! 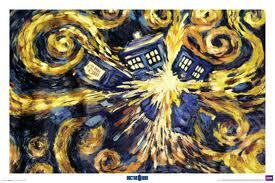 I’d go anywhere, forward or back, with the Doctor. Thanks for linking up! Hahaha Love the hot air up your petticoat! Fun post.